$49,000.00 Gold Star Medal of a Hero of Mongolian People's Republic, #4, Variation 1, awarded on 26 September 1945 to Major Dampil. Made in 23 K gold with diamonds. The Mongolian equivalent of the Soviet Hero Star, this decoration is exceptionally rare: only 50 were ever made (and only 20 of them were in the first series that had Variation 1 suspension device). This medal is almost never available for private purchase. $7,700.00 Order of the Precious Rod (aka Order of Varja), 3rd class, 4th grade, 1913 through mid-1920s. This is a decoration of the transitional period prior to the complete Bolshevik takeover and introduction of the new Mongolian award system. Only a few of them in any class are known to exist today. In excellent condition. $4,400.00 Order of Sukhbaatar (Sukhe-Bator), Type 1 screw back, #296, 1959-1961 issue. In solid 23 K gold, solid platinum, silver and enamels. 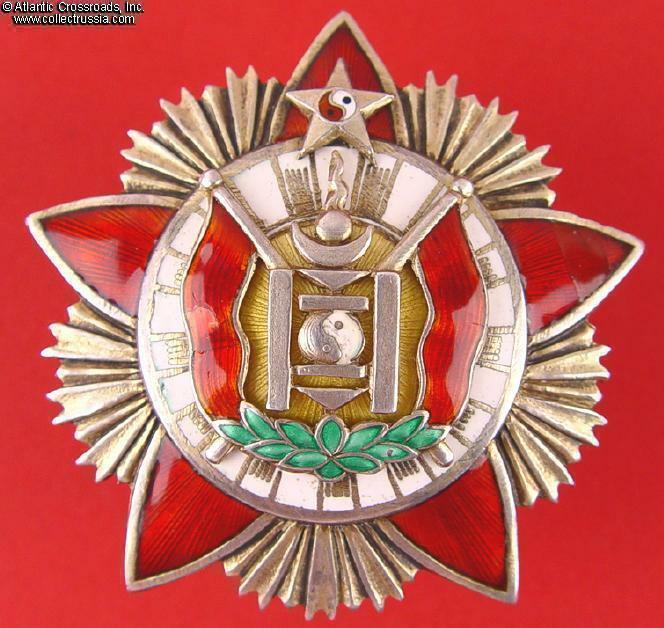 Highest decoration of Communist Mongolia, equivalent of the Soviet Order of Lenin. Only 800 of the early screw back version were made. In very fine to excellent condition. $1,950.00 Order of the Red Banner of Combat Valor, 2nd award, Type 4, #60. In near mint condition. Note the serial number, extremely low even for the scarce Second Award (only approximately 400 of these were ever made). $895.00 Order of Combat Valor, Type 1, Var. 1 (with 5 rivets), #916, early to mid- 1950s issue. In excellent condition. A very scarce piece, one of only 1000 of this version ever made. $260.00 Order of Combat Valor, Type 1, Var. 2 (with two rivets), #1013, circa 1959. Note the extremely low serial number for the Variation 2: this specimen is among the first of its version ever awarded. In excellent condition. $220.00 Order of Combat Valor, Type 2, #7098, circa 1995. In very fine to excellent condition. $295.00 Order of the Red Banner of Labor Valor, Type 4, Var. 1, #3059, circa early 1970s issue. In very fine to excellent condition. $380.00 Order of the Red Banner of Labor Valor, Type 4, Variation 1, #544. Note the extremely low serial number. This specimen is among the earliest of Type 4, bestowed either immediately after the new version became available in 1946, or issued in exchange for an earlier, Type 3 piece. A very interesting award with great research potential. In excellent condition. $640.00 Order of the Polar Star, Type 2, Var. 1, #129, circa 1940-41 issue. Note the extraordinarily low serial number, the lowest for we have seen in many years on "Uigurka." This is also one of the best examples condition wise we have ever handled. Comes with original silver screw plate of early WW2 era. A superb specimen through and through. $330.00 Oder of the Polar Star, Type 3 Var. 2, #277, circa 1946 issue. Featuring deeply concaved reverse with counter-relief, this piece is from the first series of Type 3 Polar Stars produced by the Soviet Mint in 1945-46. Includes original silver screw plate made from a "recycled" Soviet medal. A very uncommon piece in excellent condition. $150.00 Oder of the Polar Star, Type 3 Var. 3, #1480, circa 1946-47. A very interesting early specimen in very fine to excellent condition. $125.00 Order of the Polar Star, Type 4, #16080, 1972-73 issue. The last version of the higher quality Polar Stars in sterling and enamels issued during the communist era. In excellent condition. $50.00 Order of the Polar Star, 2003 type (in brass), unnumbered. In very fine condition. $50.00 Order of Maternal Glory, 1st cl. Var. 2. Excellent condition. $25.00 Order of Maternal Glory, 2nd class, Var. 1 (with hand-engraved number), #66477, circa late 1960s. Excellent condition. $15.00 Order of Maternal Glory, 2nd cl, Type 2 pin back, #173668, circa late 1980s - early 1990s. Very fine to excellent condition. $150.00 Medal for Victory over Japan, Variation 1, #1076, with a document, 1946 issue. The medal is among the earliest ever awarded - note its extremely low serial number. The document is hand-signed by Hero of Mongolia General Lkhagvasuren who had served as deputy to Marshal Zhukov at Khalkhin Gol and was second in command in the Mongolian Army during the entire WW2. A highly interesting and unusual set! $75.00 Medal for Victory over Japan, Var. 1 (with concave reverse), #2907, late 1940s. Very attractive medal by the Soviet Moscow Artists Cooperative. Note the extremely low serial number. In excellent condition. $195.00 Medal for Selflessness, Type 2, Variation 1, Sub-variation 1, 1968 - 1980s. Early unnumbered version, one of 1000 ever made. In near mint condition. $220.00 Medal for Selflessness, Type 2, Var. 2, #1723, 1998 - 2000s. In near mint condition. $220.00 Friendship Medal, #11369, with a document and original fitted case of issue, awarded to a Soviet citizen in 1988. This very uncommon set is in excellent condition. $450.00 Khalkhin Gol Medal (aka Badge for the Battle at Khalkin Gol), Var. 1, 1941- 1946 issue. Early relief reverse version by the MTKh Workshop. In superb condition, among the best examples we have seen - literally impossible to upgrade. $550.00 Khalkhin Gol Medal (aka Badge for the Battle at Khalkin Gol), circa 1946 issue. A very interesting transitional piece: Variation 1 relief reverse version by the MTKh Workshop with a Variation 2 "Monetnyi Dvor" screw post and screw plate. In excellent condition, outstanding for any early badge. $245.00 Khalkin Gol Medal, Var. 2 (flat reverse version by Soviet Mint), 1946 manufacture. Superb example in near mint condition - literally impossible to upgrade. $30.00 Medal in Commemoration of the 30th Anniversary of Victory at Khalkhin Gol, 1969. Attractive medal in excellent condition. $120.00 Honorary Medal for Combat, Type 1, Var. 2 (screw back suspension device), #3840, circa 1947 - 1950. Very attractive early piece in silver and enamel, in outstanding condition. Includes original suspension complete with mint marked Soviet screw plate. $50.00 Honorary Medal of Combat, Type 2, #12968, circa 1975-77 issue. The pin back version in silver manufactured by the Soviet Mint. In outstanding condition. $25.00 Honorary Medal of Combat, Type 3, Var. 1 (in silver-plated brass, numbered). Circa 1980s Serial number in 20,000 range. $20.00 Honorary Medal of Combat, Type 3 Var. 2, #19470, (in silvered brass), circa 1990s - 2000s. In outstanding condition. $40.00 Medal for Strengthening Combat Cooperation, circa 1980s. Awarded mostly to Soviet and Mongolian Army officers for taking part in joint military exercises of the Warsaw Pact. In excellent condition. $195.00 Honorary Medal of Labor, Type 1, Var. 1 (screw back suspension, engraved number with Cyrillic "N"), #828, circa early to mid-1940s. In silver and enamels, a beautiful Soviet-made piece of WW2 period in very fine condition, one of just 2000 ever awarded. Note the extremely low serial number. In very fine condition. $90.00 Honorary Medal of Labor, Type 1, Var. 2 (screw back suspension, engraved number without the prefix "N"), #2735, circa 1946-48. An early post-war issue in outstanding condition. $40.00 Honorary Medal of Labor, Type 3 (with stamped serial number and screw back suspension), #17606, circa 1966 issue. Near mint condition. $25.00 Honorary Medal of Labor, Type 5, #2886, 1990-1995. Excellent condition. $15.00 Medal in Commemoration of the 50th Anniversary of the People's Army, 1971 issue. Excellent condition. $10.00 Medal for 60th Anniversary of the Armed Forces, 1982. In brass and enamels. Excellent condition. $10.00 Medal for 30th Anniversary of Victory over Japan, 1975. In excellent condition. $110.00 Medal in Commemoration of the 50th Anniversary of State Security, 1971 issue. A very nicely made piece awarded to active duty officers and VIP veterans of Mongolian KGB. In excellent condition. $40.00 Honorary Medal in Commemoration of the 50th Anniversary of Mongolian Police, 1970 issue. In very fine to excellent condition. $55.00 Medal in Commemoration of the 25th Anniversary of the Mongolian People's Republic, Var. 2 (with thin numerals on the obverse), #19119, late 1940s. Very attractive medal by the Soviet Moscow Artists Cooperative. In outstanding condition. $25.00 Medal for 40th Anniversary of Mongolian People's Revolution, Var. 2, #06705. In excellent condition. $15.00 Medal in Commemoration of the 50th Anniversary of Mongolian People's Revolution, 1970 issue. The medal is of spectacular quality, in gilded brass and fine enamels. In excellent condition and comes with a separate cloth ribbon bar. $50.00 Award Certificate for a Medal for 50th Anniversary of Mongolian People's Revolution, a highly unusual 1972 issue to a Soviet citizen. In excellent condition. $15.00 Medal for 60th Anniversary of Mongolian People's Revolution, 1981. In brass and enamels, excellent condition. $10.00 Medal for 70th Anniversary of Mongolian People's Revolution, 1990. Very fine to excellent condition. $15.00 Award Certificate for Medal for 70th Anniversary of Mongolian People's Revolution, 1991 issue. $15.00 Medal for 80th Anniversary of Mongolian People's Revolution. $50.00 Medal of Glory of Virgin Lands Developer, Var. 2, #2608, 1984 - 1990. An uncommon medal: only some 3500 of both of its versions were ever awarded, less than a third of which were Variation 2. In very fine to excellent condition. $110.00 "The Orders and Medals of the Mongolian People's Republic (1924-1992)" , Khuujii Urnukh, 2010, Ulaanbaatar, Mongolia. In English; 272 pp, softcover. Large 8 1/4" x 11 3/8" format. The text is filled with previously unknown information. It brings the collecting of Mongolian awards to a whole new level by covering the varieties of each order and medal. Highly recommended!